The Model S, shown, is currently Tesla's only vehicle. The company will add an SUV next year. BERLIN (Bloomberg) -- Tesla Motors plans to expand its network of fast-charging stations to enable owners of the Model S sedan to drive across Europe by the end of this year. The U.S. electric-car maker opened three stations on Thursday along German highways to facilitate travel from Germany to Switzerland and Austria. 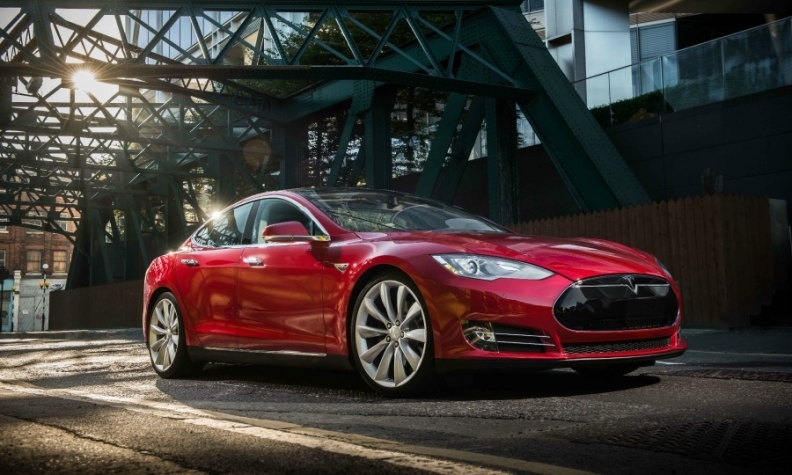 Tesla, which has at least 36 sales outlets from Sweden to Italy, plans to add more chargers across the continent in the course of 2014. It now has 23 stations. "This shows how important the European market is for Tesla," the company said. The carmaker, led by CEO Elon Musk, plans to open more than 30 new service centers and stores in Europe as it anticipates a jump in sales for the Model S, priced from 65,740 euros in Germany. The move is part of a global rollout as Tesla forecasts a jump in deliveries of more than 55 percent this year. The company also intends to spend as much as $5 billion to build the world's largest battery factory. The facility would let Tesla create cheaper cars and expand market share. On Tuesday, Automotive News Europe reported that Tesla will begin deliveries of its second model, an SUV, early next year.